Sunset Hill Stoneware has created stoneware for dozens of big-name organizations over our 20-year history, from high-end resorts and breweries to national parks. We've proudly depicted the artwork of almost everything in between as well, including bands like the Grateful Dead. The Grateful Dead has been the go-to band for hippies since 1965 and celebrated its 50-year anniversary in 2015. Since its formation, the rock band released more than 140 studio albums and performed at more than 2,300 concerts worldwide. They’ve also produced some of the most easily recognizable artwork in music, which we’ve been putting on our mugs for Dead.net, the band's official site, since 2011. Our owner, Tom, is a fan. 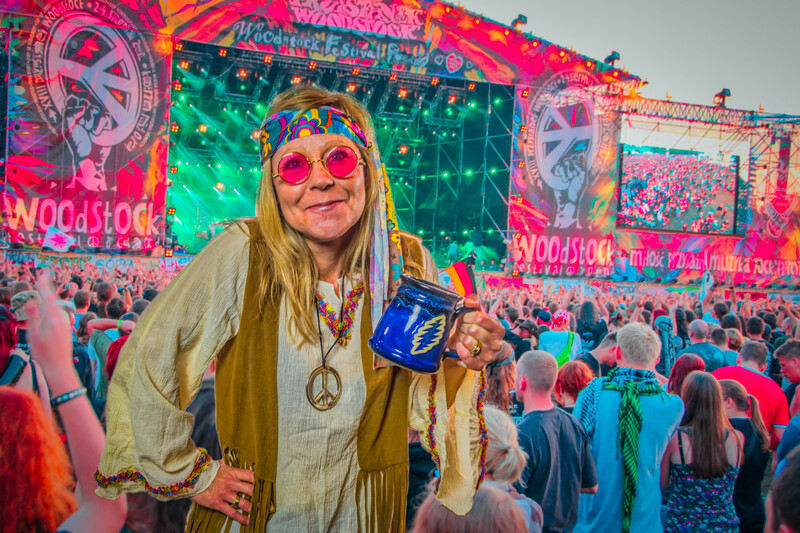 With 2018 marking our 20th anniversary, we wanted to take a moment to honor our history as deadheads and look at the highlights of some of the Grateful Dead mugs and beer steins we've done over the years. There are several different images associated with the Grateful Dead that are immediately recognizable and fittingly surreal. We've put all of these and more on our stoneware in limited, special editions for Dead.net. The Grateful Dead used skulls and skeletons for a lot of album artwork during its heyday. One of the earliest examples, the Skeleton and Roses design, was also on some of the first pieces Sunset Hill Stoneware produced for the band back in 2011. The skeleton wearing a crown of roses was sold on our Executive Slim mug in midnight black. 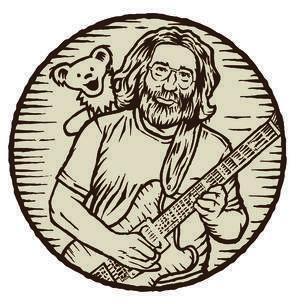 The Dancing Bears are among the most recognizable symbols found on Grateful Dead merchandise. Originally found on the album History of the Grateful Dead, Volume One (Bear's Choice), the multicolored bears have been featured on multiple special editions of our stoneware—and plenty of acid paper—over the years. They even marched across a set of four shot glasses we created for the band in years past, each taking a different step across the glass. Accompanying the skeleton during our earliest runs was a red, white and blue skull with a lightning bolt inside of it, also known as the Steal Your Face skull. We've put several different versions of this unique artwork on our mugs, including another early run on our Double Barrel stein in Sunfire Red. 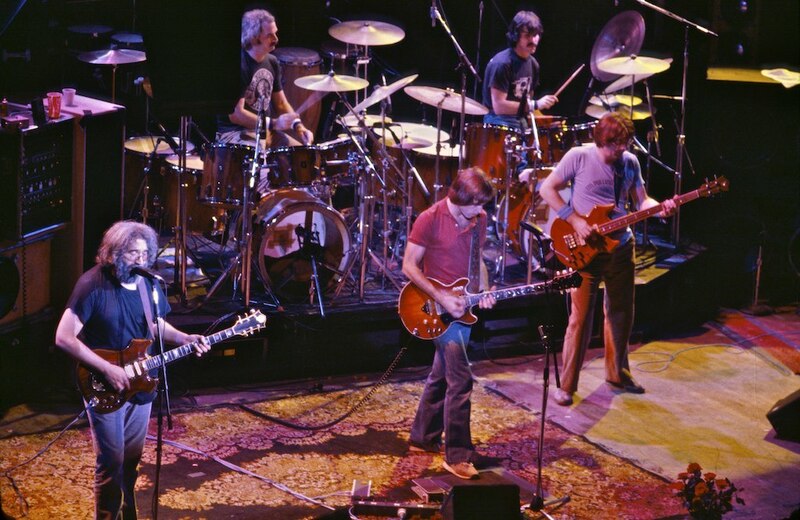 Originally, the Dancing Terrapins debuted on the 1977 album Terrapin Station. The banjo- and tambourine-playing turtles have graced us with their presence before on our Mid-Day Memories mug for a limited run previously, including this sample in Sandstorm, and they remain one of the most recognizable pieces of artwork that the band has ever produced. In the past, we've also created some variations on the artwork we typically provide for the Grateful Dead's web store. A few of our favorites include the Grateful Dad mug, created just in time for Father's Day and featuring one of the dancing bears sporting a holiday-appropriate necktie; and a Grateful Dog water dish for the hippie hounds of the world. We also ran a special edition mug for the Grateful Dead's 50-year anniversary in 2015. Featuring the Steal Your Face skull commemorating the band's big anniversary and adorned with roses, the Silvery Night mug was also emblazoned with "The Golden Road to Unlimited Devotion," the name of the first track on the Grateful Dead's first, self-titled debut album. 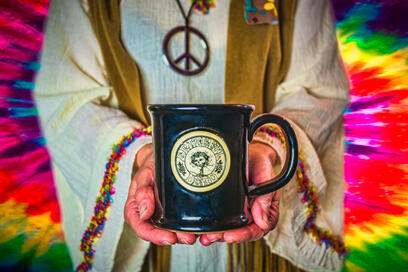 In conjunction with the 50th anniversary, we also created a very special edition mug for the Fare Thee Well tour. 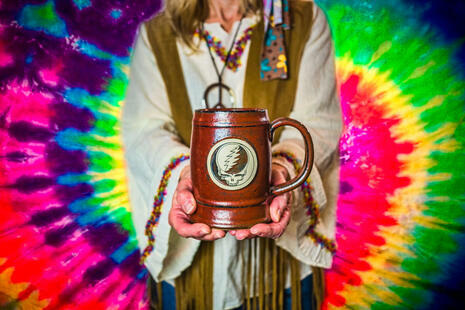 Just in time for the five concerts performed in June and July 2015 at Levi's Stadium in Santa Clara, Calif. and Soldier Field in Chicago, the mug incorporated design elements from the Grateful Dead's best-known artwork, including the dancing bears and Steal Your Face lightning bolt to form an emblem specially for the tour. After seven years, we're still working with the band's creative management to bring unique Grateful Dead coffee mugs and other merchandise to deadheads all over the world. A Blue Moon mug with the lightning bolt originally inside the skull is also for sale exclusively on Dead.net at time of writing. We've done merchandise for plenty of bands and entertainers over our 20-year history, and we always welcome you to consider our stoneware for your merchandising needs. No matter who we serve though, the Grateful Dead will always hold a special place in our hearts.